How perfect is the June kit! When I opened my kit I knew exactly what I wanted to do with it. some of the bee-utiful embellishments I decided I wanted to use them to decorate my own box so that’s exactly what I did! First off I started by adding some of the patterned papers to the top and sides of the box (which I purchased for £1 from The Range), I then used the stencil with some white paint on part of the lid before layering some of the die cuts and stickers on top. 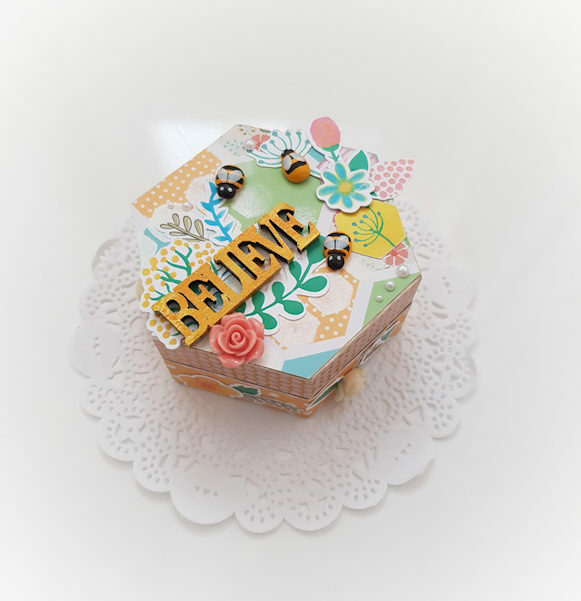 I painted the ‘Believe’ embellishment to match the papers and then added it to the box along with a resin flower and the super cute bee embellishments. 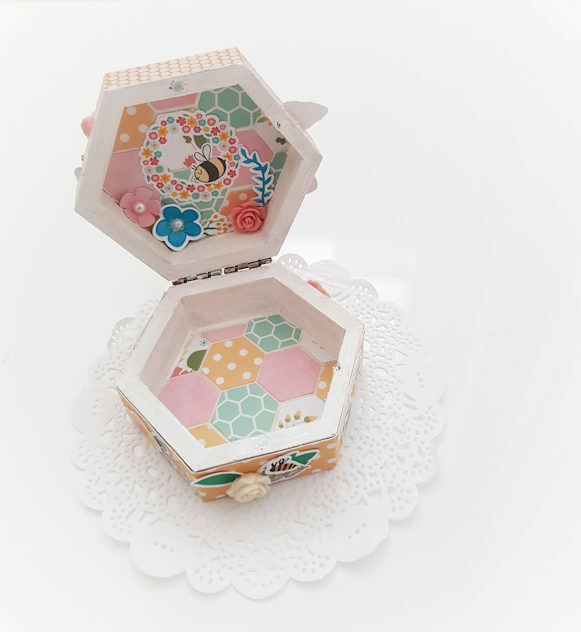 I also added some of the die cuts, stickers and resin flowers to the sides of the box. Inside I decided to give the box a wash of white paint before cutting hexagons from the papers and sticking them in, I then decided to embellish the inside lid a little more so I added a couple of the stickers and die cuts as well as another resin flower. I’m pleased with how it turned out and it now sits nicely in my bedroom ready for me to put little bits and pieces in. I’m really enjoying using the June kit and I hope you are too. Very creative and sweet! Love this.